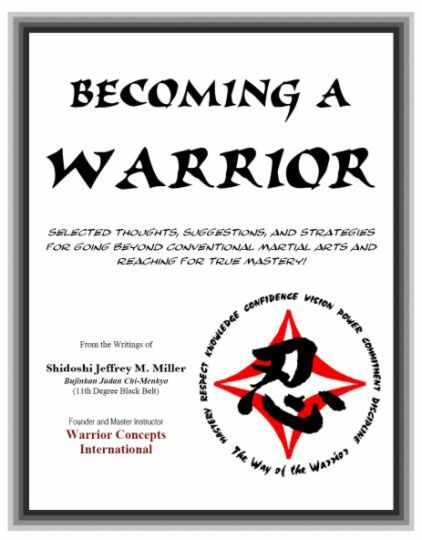 Becoming A Warrior - How to Become a Modern-Day Warrior and Self-Defense Expert! 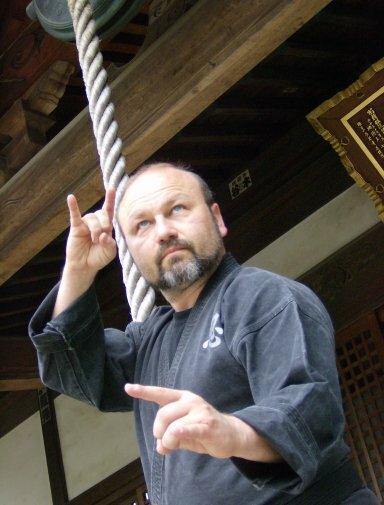 There are hundreds of "gurus" online and off who want to teach you self-defense. It seems that everyone and his grandmother has a theory about how to master martial arts and defend yourself. Don't listen to them. I'm going to show you how to learn the most basic lessons for staying safe--and I'm going to give you the insights into what it takes to be a true modern-day warrior. Using the same lessons and tactics found in my book, "Becoming a Warrior", I have successfully survived deadly street attacks, learned how to train correctly, and now have students who have gone on to do the same. Read on to find out how. In 1984, a person I thought to be my friend, flew into a violent rage and tried to attack my wife. After redirecting his attention onto me, he grabbed a broomstick and came at me, screaming "I'm going to kill you!" Using a basic move that I still teach to my students today, I was able to avoid his attack, circle behind him, and catch him in a painful, immobilizing lock with one step. And then I said one thing to him that immediately stopped any further aggression on his part. In 1987, while on duty as a military police officer in Germany, I was attacked by a drunk martial artist. Contrary to the typical karate school setup with lots of room for doing fancy kicks and what-not, my attacker was nose-to-nose with me when he launched a surprise attack that is NEVER taught in martial arts and self-defense classes. Even though he was taller and out-weighed me by at least 50 poinds, I was able to control his attacks, take him to the ground and lock him up while my partner stood helplessly, trying to figure out what to do next! A few years ago, a prospective student came into my academy to take some lessons. After finding out that he was being treated for mental illness, I required that he get a letter from his doctor stating that training would not create a danger to himself or others. Shortly after leaving, the prospect came back in demanding his lessons and threatening to beat up everyone there. Instead of letting things become physical and risk losing my school and reputation over this individual, and using simple tactics of body positioning and language skills, I was able to distract and confuse the would-be attacker long-enough to get him out of the facility. Along the way, working as a police officer, undercover drug suppression and black market investigator, private detective, and body guard, I have dealt with some of the meanest, toughest, and deadliest criminals and enraged individuals in the world. And, I've done it all over the world. Now, I'm not telling you these things to impress you, but to impress upon you that I didn't just go to somebody's class, learn some tricks, and then set myself up as a teacher. I'm telling you these things because you need to know that the person you're learning from doesn't just have some knowledge and information, but the background and experience from which to teach. Telling you what I've done doesn't tell you anything about my ability to help you to defend yourself. So, how about some proof from some of my students? Nate came to me when he was thirteen years old. He had been studying Tae Kwon Do for eight years and was already a black belt with tons of tournament trophies under his belt (so-to-speak). One night, long before he got his black belt from me, he and two friends were attacked by two thugs in a mall parking lot. One of the attackers was armed with a knife. Nate tried to use the de-escalation skills he learned from me, but the situation was only going one way. While he was trying to control the situation and keep the knife-wielding attacker focused on him, all hell broke loose. Nate was attacked by the knife-wielder while his friends tried to deal with the second assailant. When it was all said and done, Nate had disarmed the man with the knife and saved his friends who weren't doing so well against the other attacker. He sent both attackers limping away and saved himself and his friends. And he did it without using any of his previous Tae Kwon Do lessons. 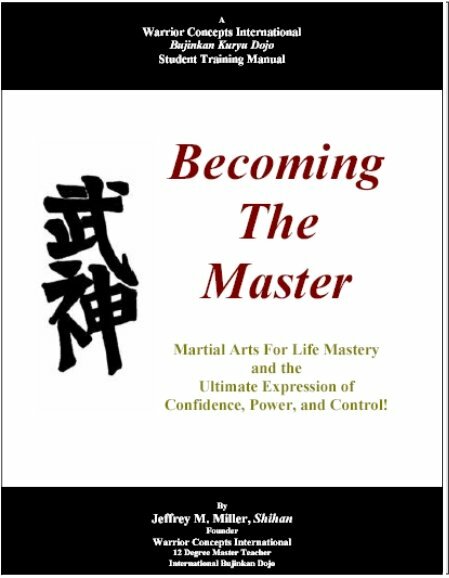 He said that the situation unfolded exactly the way he was taught they would in my classes and there was absolutely nothing that he had previously learned in the other martial art that would have worked in that situation. Nothing! Eric, discovered that his lovely wife was having difficulties with emotional and mental stability. They sought treatment but, during the initial stages, his wife had a terrible reaction to her medications. One day, out of the blue, she became agitated, and the agitation turned to violence. Not wanting to be damaged by is wife's attacks with a bat she had picked up, but not wanting to hurt her either, Eric found himself in the worst situation possible: how do you defend yourself against someone who you don't want to hurt? Using simple positioning tactics, he was able to corner her so that she couldn't hit him with her flailing attacks. Then, using some other simple control techniques, he was able to restrain her and call for emergency services. Bonnie was just starting out in classes. In fact, her first class was scheduled to start on Monday, and it was the previous Friday afternoon. Out of the blue, Bonnie asked me what she could do, knowing nothing, that if she were attacked before she started training, that would work. I gave her an answer that, if she was attacked in the typical way that women have to worry about, should do the trick. Only to find out later that life will test you at every turn. THAT Saturday - the next day, Bonnie was walking from her friend's house to her own. She lived in the country so, the walk was along a back road, but only a few hundred feet from door to door. She watched as a college-aged boy road by her on his bike and then she didn't think any more about him. That is, not until she was being grabbed from behind and pulled off her feet into a row of bushes that lined the road! Getting her whits about her, Bonnie did exactly what I told her to do. She grabbed the man's face and got as close to him as possible and, screaming in his ear her cries for help, unleashed a barrage of strikes and kicks until he released his hold on her. Then, leaving him dazed, hurt, and confused, she bolted for her front door to call the police. Now that I have your attention, and you have the proof that I am who I say I am, let me tell you what all of the "gurus" are claiming these days--and why they're all wrong. 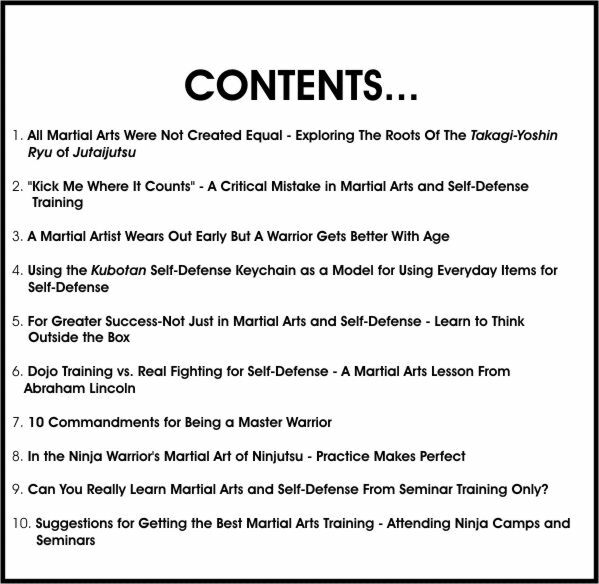 You see, the "gurus" of martial arts and self-defense want you to believe that you have to invest hundreds or thousands of hours in their style or system in order to have the knowledge you need to be able to defend yourself. Or, they want you to believe that if you simply learn the "seven magic techniques", or whatever, in their book or video, that you'll become this instant expert - this modern warrior - and suddenly have the power to have any killer who even thinks about touching you peeing in his pants and crying for mommy. They want you to think that there's great hidden secrets that only they have, and the only way for you to get a hold of them is to break out your credit card and start spending loads of cash. I talk about this in my book, "The Karate-Myth," in my newsletter, and on my blog all the time. There seems to be no end to what some of these so-called "experts" or modern masters will pass off as warrior training. Which path do you think the ancient warriors took to prepare for handling dangerous situations - especially when they lived in dangerous times where the possibility of danger was everywhere? Do you think they blindly accepted anything anyone told them, or do you think they looked at what the problems of the time were and then found people who had the experience dealing with those problems to teach them what they needed to know? The answer should be obvious. Most people today don't buy the "Hi-ya", karate-style path to self-defense because it doesn't look like it's designed to handle the street thug with the Saturday-Night Special or pig-sticker he learned to use in prison. Most people today are wary of the "guru" who sounds one way in class and then lights up and gets drunk "with the boys" at the bar after class. Do you know what most real experts think of the majority of martial arts and self-defense classes today? They think they're kid-games feeding the egos of two people: the teacher who wants to show off some tricks without any background or real-world experience, and: the student who has no idea what a real self-defense situation is like or what true warriorship is. Do you know what a true warrior, leader, or master looks and act like? I bet you have a good idea, and it has nothing to do with walking around with your chested puffed out like you're the toughest thing in the neighborhood. Well I'm about to show you show you the mental and physical lessons that I've used time and again to produce results and overcome bad situations. I'm going to share with you what I've learned from real warriors who walk peacefully but have the ability to handle whatever comes their way. Imagine, every day of your life, having the ease, happiness, and freedom to be and do what you want because you're not worried about being attacked. Not that you won't be attacked. But, living your life knowing that if something were to happen, you could handle it. Imagine, going beyond physical self-defense and reaching deep within yourself to find a sense of calm, direct strength and power that would allow you to be more successful and accomplish your goals without the need for anger, hatred, or malice. To teach you all of this, I've put together an ebook called "Becoming a Warrior." It's a knowledge-packed book that combines lessons for both modern-day self-defense, and bringing out the warrior inside yourself. through the first 5 Mastery levels in the close-quarter combat art of Ninjutsu! or click here and get your free ebook now! If you're serious about your progress towards mastery, you will get this ebook, right now and read the book today. Remember, if you want to becoming a warrior, you must learn from warriors. Can you guess what it will cost you to get this powerful, life-empowering, information that can propel your training to the next level? Yes, for the price of a fast food dinner you will have all of the information and knowledge you need to jump full force into the realm of becoming a modern-day warrior. I'm only charging $7 for this ebook, and not giving it away, for 2 reasons. 1. $7 puts the book well within reach of the vast majority of people. It's not too expensive for even the humblest beginning warrior student. 2. Anyone who's not serious enough about their training efforts to invest $7 into this book isn't going to take the time to use the knowledge laid out in the book anyway. So if you're serious about your training, and if you would like to start living and thinking like a real warrior, click the "Buy Now" button below. If you need to justify the expense, skip going to McDonald's for dinner once this week and it's paid for. No risk! If you're not completely satisfied, just ask for a refund within 14 days - no questions asked. P.S. 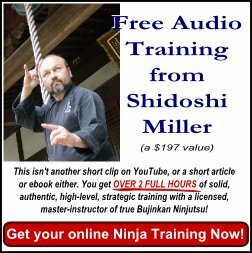 Seriously, for just $7 I'll share with you the methods that I and other real experts and modern-day warriors used to develop our skills and start living a warrior lifestyle, going on to become teachers ourselves. And, you'll have the unique opportunity to begin producing results with these lessons right away! You'll be more prepared to handle yourself, and you'll be more knowledgeable about what it really means to live and think like a warrior. Now, how can you pass on all that?